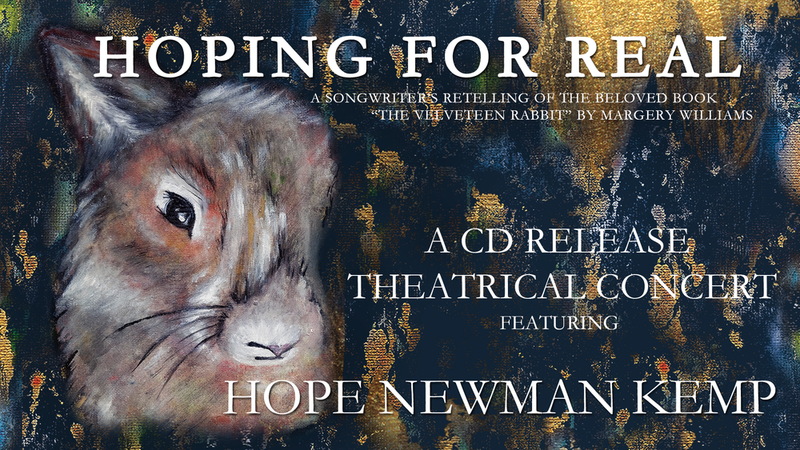 Songs inspired by the beloved book, "The Velveteen Rabbit", by Margery Williams, Hoping for Real is a debut song gallery written and performed by Hope Newman Kemp and a gang of her super talented friends. The recording is produced by Ben Hardesty (The Last Bison). Hope and the band are showcasing on August 16-17, 7:30 pm, Studio 1 Burlington, NC. Click Tickets for info! The question of my sage season; how to take a long preserved passion and move from homeschool mom to songwriter? I'm an old dogs, and these things are new tricks. And, I'm a slow learner. My daughter-in-law (herself a songwriter) suggested recording a "Song Series", and the idea breathed instant life into a starving creativity. Turns out a Song Series is just what it sounds like: a series of songs that work together to explore a story. The story is the important thing, so I searched for a story rich in nuance and profoundery but untethered from on-the-nose plots or dialogue. In what has become its own story, "The Velveteen Rabbit" showed itself one day. The songs began writing themselves with almost frightening fervor. I believed recording them required a producer with a sensitive ear. Benjamin Hardesty (songwriter and front man for "The Last Bison") was my first choice, and to my astonishment he agreed to the work with equal enthusiasm. 1 year to the day that we started, Hoping for Real was born. If you grew up with the book you most likely have fallen in love with it; so many have told me how important this whimsical little story is in the history of their childhood. For your sake, I hope you see how tenderly we've tried to treat your love. If you haven't, I hope you fall for it as I have. May we all be found and transformed by Love! What's Next for Hope Kemp Music? "A Swan's Song: beauty for the longing heart" is already in the works! Inspired from the story of an ugly little duckling who finds his true nature among the beautiful swans. This project will be an EP and recording begins soon! "Stories and Steeples: a collection of songs for the journey" will be a full length roots soul project using borrowed words from poets with stronger minds than mine. I hope to begin preproduction on this project very soon, and am very excited about sharing these stories!